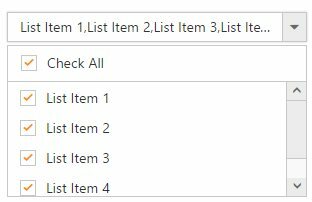 Add check all option in popup list? Note: While rendering a control in the partial view, we need to specify @Html.EJ().ScriptManager() in the partial view page after the initializing the control. When you enable the unobtrusive in your application, refer to the ej.unobtrusive.min.js file in the application. After setting the value as true, refer to the unobtrusive script file in the _Layout page as shown in the following code example. Render the partial view into parental view. Render the DropDownList with the empty DataSource, In client event called “click” of Button control, the AJAX post is called. Once the AJAX call is success, bind the data to the dropdown list on AJAX call by using the property “dataSource”. You can remove the validation error message of DropDownList on selecting an item through change event using the below code. this.element.valid();  //validation of dropdownlist through change event. The following code illustrates the rendering of DropDownList using DropDownList properties from code behind.